Dr. Linnea A. Theisen has an integrative veterinary practice based in New Bern, North Carolina. The modalities of this practice include acupuncture, veterinary spinal manipulation therapy/animal chiropractic, laser therapy, thermal imaging, tui-na, homeopathy, and Traditional Chinese Veterinary Medicine food and herbal therapy. Dr. Theisen received her certification in Veterinary Spinal Manipulation Therapy at the Healing Oasis Wellness Center, a nationally accredited institution with a program that entails 226 hours of Post-graduate Education Certification. Her acupuncture and food therapy certifications were completed at The Chi Institute of Chinese Medicine, after taking a 130+ hour continuing education program. Dr. Theisen received her Doctorate of Veterinary Medicine at Tuskegee University in 2010. 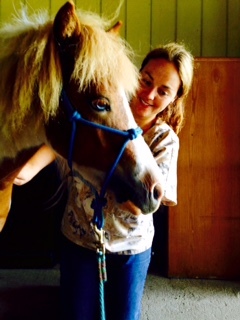 Following graduation, she worked as an associate veterinarian at a busy large animal ambulatory practice in eastern NC until January 2015, when she decided to start her own integrative practice. Dr. Theisen's four-legged family includes a mule named Marvin, 3 dogs (plotthound mix - Jake, golden retriever - Dylan, beagle - Odie), 2 cats (Sugar and Sweet Pea), and 2 potbellied pigs (Cici & Maddi). When not working, Dr. Theisen and her husband, Tollen, enjoy hiking with their dogs and being outdoors, as well as traveling to Western NC and Michigan to visit with family and friends. Dr. Theisen is currently licensed to practice in North Carolina and Michigan.